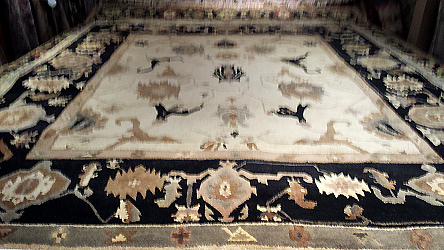 This handmade-in-Nepal Tufenkian transitional-modern rug with antique ivory field and black border was brought in to Nejad Rugs in Doylestown PA for Dog Urine Stain and Pet Odor Removal. The rug was hand-washed and all odors removed and all stains cleaned by Nejad expert stain-removal technicians. The rug was restored to its original condition and returned to client residence in Langhorne Bucks County PA 18925. Custom designing an Oriental rug for a client is always a very special experience. One of my favorite rugs that I designed was for clients in Lehigh Valley, PA called “Morning Spring.” The couple’s magnificent 10,000 sq. ft. house had just been finished and almost all of the rugs had been pre-selected from our enormous inventory of new and antique oriental rugs showcased in our Doylestown showroom and two huge warehouses. The clients’ professional interior design firm, with whom I had previously worked on several projects, carefully coordinated the paint colors, wallpapers, drapery and upholstery fabrics with each rug. Before one piece of furniture was placed, the builder had already expertly finished each room according to the designers’ exact specifications – down to the Brunschwig & Fils ¼ braided silk trim on the Old Weavers silk damask upholstered walls. Even the hardwood floor border designs and impressive double staircases were made to accommodate each rug and runner’s exact size and shape. for the background which I kept pretty open. I looked at hundreds of floral sketches before I drew my own delicate multi-toned yellow and periwinkle blue blossoms and dainty buds connected by neutral tertiary colored vines for a border, spandrel corners and scattered accent motifs in the field. When the rugs were finally finished overseas by my expert weavers, shipped to the Philadelphia seaport, delivered to the client’s home still wrapped in burlap and then unrolled with much excitement in the daughter’s sunlit room with 13ft high ceilings, three walls with tall windows, gorgeous Austin Horn lace bedding and window treatments with the walls and ceilings classically faux painted the effect was nothing when less than stunningly beautiful!